Painted garden bench with dark stain and blue paint. 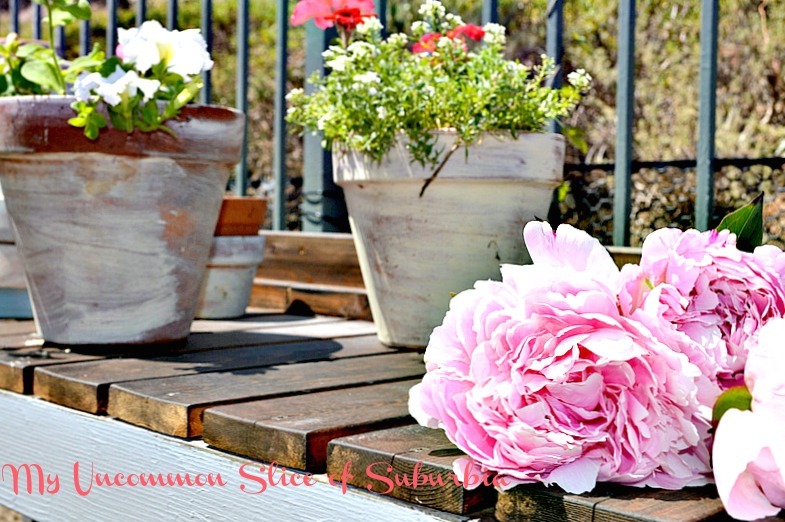 During the Summer I love to have an abundance of potted flowers, it just makes me happy! Years ago my hubby had built a workbench which we eventually converted into my gardening bench. With years of weathering the top and bottom collapsed, so he added planks of exterior-grade lumber. This way the water can drip down and into the grass instead of resting on top and eventually caving in again. I stained the new wood with a dark ebony and gave the existing wood a fresh coat of paint. 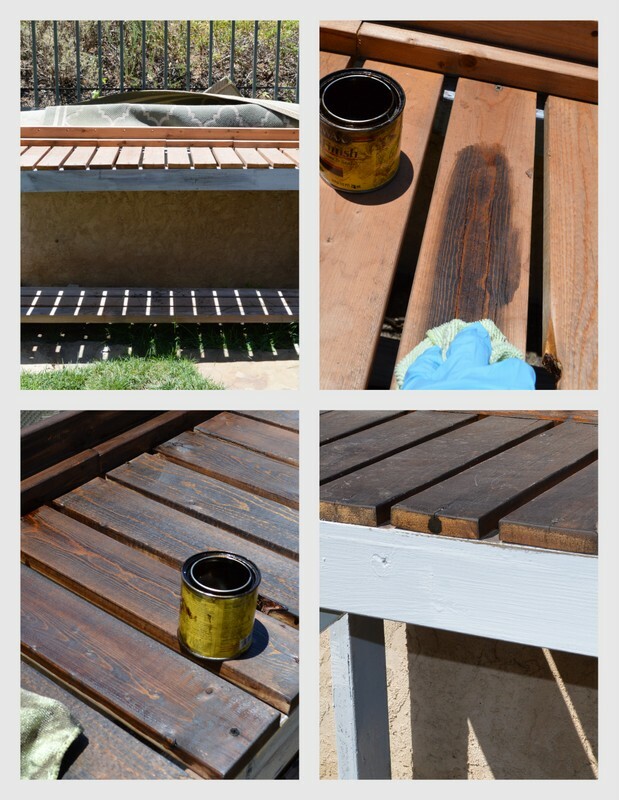 I had debated staining the whole bench but I am really enjoying having it two toned. 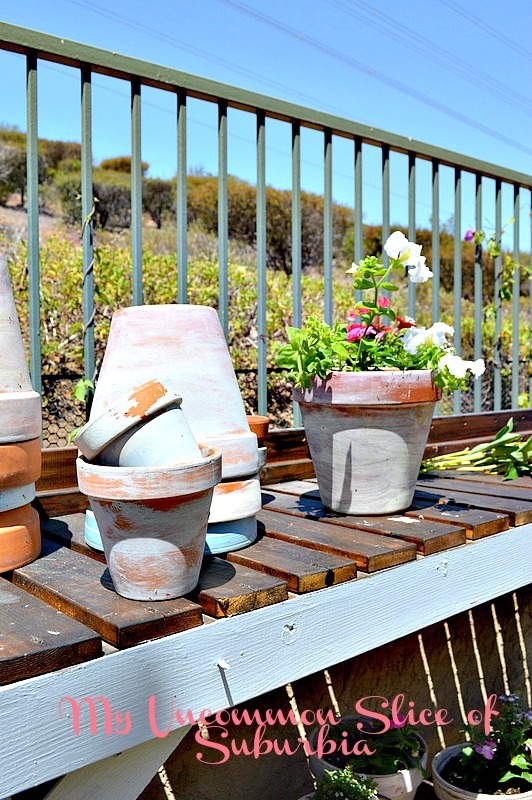 You can see how I aged the Terra Cotta Pots here. Is your space ready for the summer? 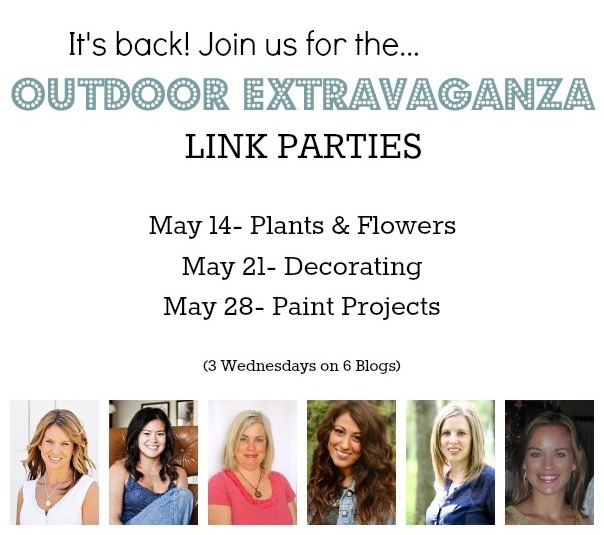 Come back tomorrow to link up your outdoor painting ideas. 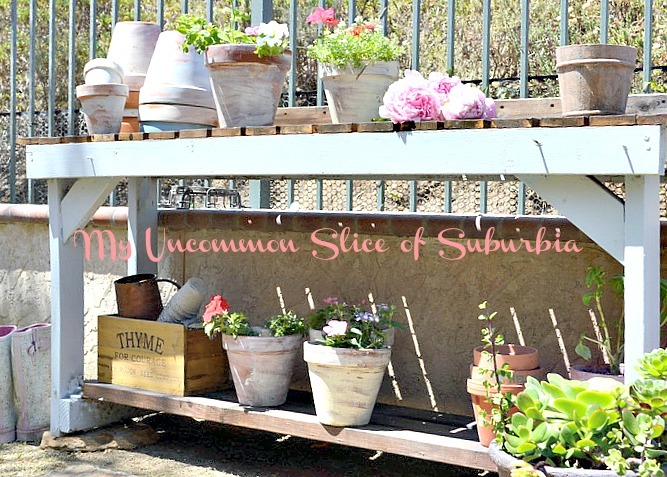 Don’t forget check out these lovely girls and their awesome outdoor spaces. it looks gorgeous! love the new top! 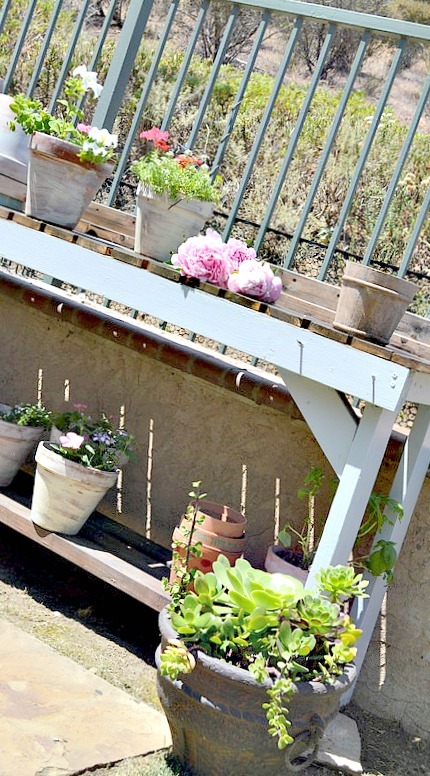 with all the gardening that I love to do around here, that’s one thing i don’t have …a cute potting bench.this may just be the next outdoor project. Love it! I still need get get some pots and paint them. Gorgeous paint makeover Kristin!!! Your yard looks so pretty! Gardening is my happy place! I don’t have a potting bench and love yours. The color you chose with the dark top is really nice. Your outdoor area is gorgeous Kristin with all or that open space in the back. Glad you are safe and sound after the awful fires down there. Beautiful! 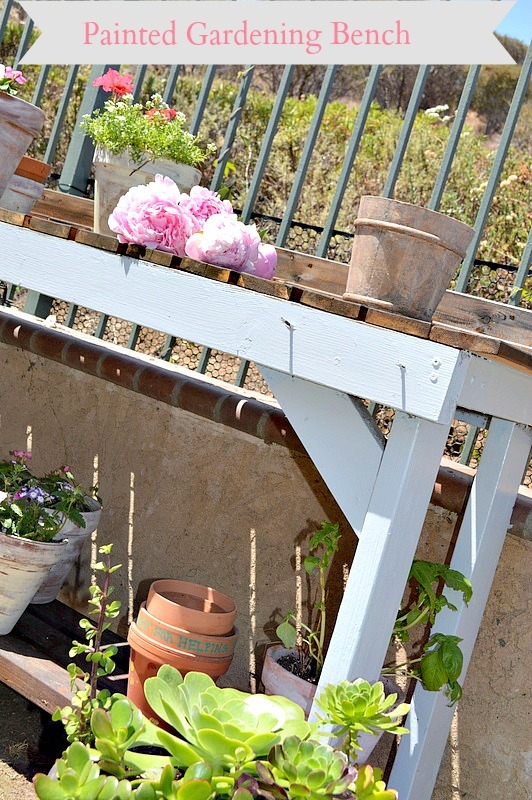 A potting bench is on my list… but the list gets longer every day! Your outdoor spaces always make me smile… they are inviting and perfect for enjoying a chat with family and friends… how wonderful! I love your bench! So gorgeous! Your bench looks great Kristin, I like the dark wood against the white! Unfortunately, my backyard looks pathetic. I have a vision for it though! Including a potting bench. Thanks for the beautiful inspiration.